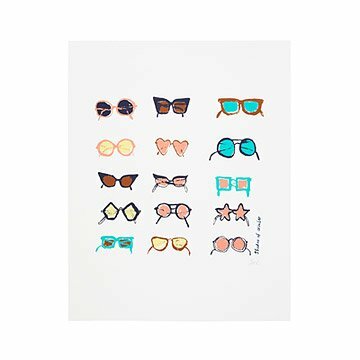 This colorful screenprint depicts a collection of vintage sunglasses. What do you do with that shoe box of mementos in the back of your closet? If you're artist Danielle Kroll , you turn it into art. Her inspiration for this sunny handmade screenprint are the charming vintage sunglasses her mother collected as a child. To create the playful shapes and bright palette, Danielle applies the five colors individually, then signs and numbers each one. Handmade in Brooklyn, New York. We were lucky enough to visit Danielle's sunny Greenpoint studio for a tour and Q&A. See the space where she dreams up her playful prints on our blog. Danielle Kroll is a Brooklyn-based artist and designer. She graduated from Tyler School of Art and started her career in a popular clothing retailer's Art Department. After several years of gaining freelance clients on the side, Danielle left her job to pursue a career in illustration. Danielle has been painting since the 5th grade and is always experimenting with new techniques and mediums. Her current work includes illustrations, ceramics, paintings, and textiles. Her work may be recognized by its unique color palettes, simple subject matter, and its stylistic nod to the past.